It is designed to be used inside waistband and to be used as a pocket holster, hence the name Fusion. 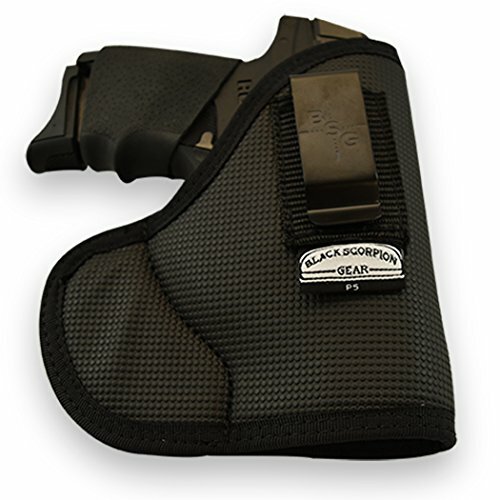 Its material is adherent so that in the pocket it can be drawn comfortably, this makes it a multifunctional holster. Its Corrugated Nylon material for its greater adherence to the pants. Satisfaction guaranteed. The Punisher P5 Fusion and IWB Holster. One of the few holsters that can be used inside the pocket or as an IWB appendix holster. It is designed to keep its position in the pocket, and can draw easily. It can be used in an IWB inside waistband appendix position, also allowing a fast draw. Fits: Glock 42,43 / Ruger LC9S / Sig P365 all Similar size Gun. Black Color and Strong Nylon Material and our Metallic Belt Clip.